"To those who tried to divide us, I want to tell you that you have not succeeded," Prime Minister Abiy Ahmed said. ADDIS ABABA, Ethiopia — A thwarted attempt to hurl a grenade at Ethiopia's reformist new prime minister led to a deadly explosion Saturday at a massive rally in support of sweeping changes in Africa's second most populous country. Nine police officials were arrested, state media reported. Witnesses said a man tried to throw the grenade at the stage as Prime Minister Abiy Ahmed waved to the cheering crowd of tens of thousands shortly after he made a strong appeal for unity following months of anti-government protests. Addressing the nation minutes after he was rushed to safety, Abiy called the blast a "well-orchestrated attack" but one that failed. He did not lay blame and said police were investigating. At least one person was killed and 155 people were hurt, nine critically, Health Minister Amir Aman said. "The prime minister was the target," a rally organizer, Seyoum Teshome, told The Associated Press. "An individual tried to hurl the grenade toward a stage where the prime minister was sitting but was held back by the crowd." The man with the grenade was wearing a police uniform, witness Abraham Tilahun told the AP. Police officers nearby quickly restrained him, he said. "Then we heard the explosion." Nine police officials were arrested, including the deputy head of the capital's police commission, state broadcaster ETV reported. AP video from the scene showed bloodstained ground and abandoned shoes while people chanting the prime minister's name fled, some clutching their heads in shock and despair. The attack was "cheap and unacceptable," the prime minister said, and added: "Love always wins. Killing others is a defeat. To those who tried to divide us, I want to tell you that you have not succeeded." The ruling party in a statement blamed "desperate anti-peace elements" and vowed to continue with the country's reforms. The explosion in packed Meskel Square in Addis Ababa followed weeks of dramatic changes that shocked many in the East African nation after years of anti-government tensions, states of emergency, thousands of arrests and long internet shutdowns. The 42-year-old Abiy took office in April and quickly announced the release of tens of thousands of prisoners, the opening of state-owned companies to private investment and the unconditional embrace of a peace deal with rival Eritrea. Websites were unblocked and opposition figures were invited to dinner. Ethiopians said they could hardly keep up with the pace of change. 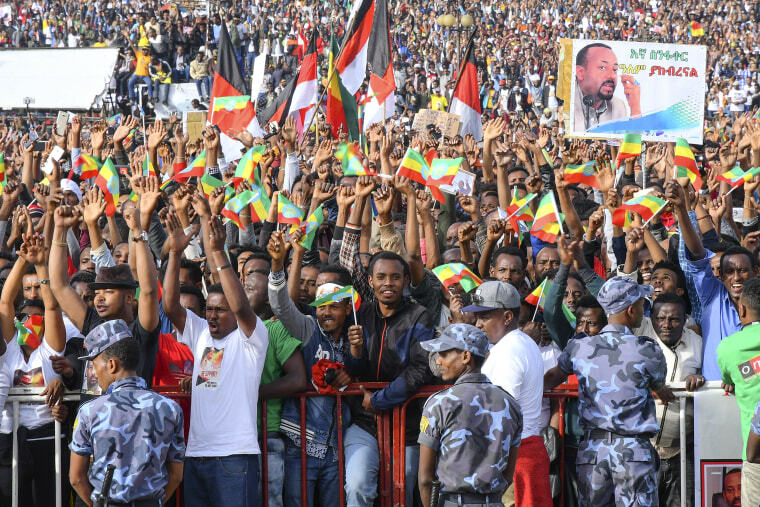 Saturday's rally began as a show of exuberance, with supporters wearing clothes displaying Abiy's image and carrying signs saying "One Love, One Ethiopia." Informal in a neon green T-shirt, Abiy told the tens of thousands of supporters that change was coming and there was no turning back. After the explosion the state broadcaster quickly cut away from coverage of the rally, which broke up with people singing, chanting and going back to their homes. "I've never thought this day will come in Ethiopia. I'm very emotional right now," said supporter Mulugeta Sema, who wore a T-shirt with the new leader's image and spoke before the blast. "We should never get back to dictatorship. This is time for change." In a sign of the new effort at dialogue between bitter rivals after a deadly border war and years of skirmishes, one Eritrean diplomat, ambassador to Japan Estifanos Afeworki, said on Twitter that his country "strongly condemns the attempt to incite violence" in Saturday's attack. The United States has been among those in the international community expressing support for the dramatic changes in Ethiopia, a key security ally in a turbulent region with neighbors including Somalia and South Sudan. The U.S. Embassy on Saturday said "violence has no place as Ethiopia pursues meaningful political and economic reforms." Not everyone has cheered the changes. Some Ethiopians in the north near the border with Eritrea, one of the world's most reclusive nations, have protested the embrace of the peace deal. And the Tigrayan People's Liberation Front, a party in Ethiopia's ruling coalition that has been the dominant force in government for most of the past 27 years, said the announcement on the peace deal had been made before the ruling coalition's congress met to discuss it: "We see this as a flaw." Abiy is the first prime minister from the Oromo ethnic group, the largest in the country, since the ruling party came to power in 1991. Ethiopia's sometimes deadly protests demanding more freedoms began in the Oromia and Amhara regions in late 2015 and spread elsewhere, finally leading to the resignation of Prime Minister Hailemariam Desalegn early this year. Abiy visited the restive regions shortly after taking office and stressed the importance of resolving differences through dialogue instead.